January 22, 2018: Workshop on Narrative Nonfiction: History and Biography,” at the Writers Center in Bethesda, Maryland. November 18, 2018: Spoke at dedication of new display on the National Mall in Washington, D.C., to mark the site of the assassination of President James A. Garfield in 1881. July 9, 2018: BOSS TWEED flesh start!! Announced partnership with NoEgo Films to produced a scripted drama TV series based on my 2005 biography BOSS TWEED: The Corrupt Pol who Conceived the Soul of Modern New York. Stay tuned for developments! February 13, 2018: Thanks again to PBS, this time for the chance to appear on their new American Experience Documentary “The Bombing of Wall Street” about the 1920 attack, including the role of young J. Edgar Hoover. May 20, 2017: Panel on “Going Indie” at the Biographer’s International Organization (BIO) annual conference in Boston, Massachusetts. April 28, 2017: Panel on “Great Lives Reconsidered: Rehash, Revision, or Revelation” at Washington Independent Review of Books’ “Books Alive!” conference, 1:45 pm, in Hyattsville, Maryland. April 12, 2017: Book talk at Cooper Union‘s Rose Hall, 30 Cooper Square, New York, NY. March 24, 2017: Panel on “It’s Complicated: US & USSR Relations” at Virginia Festival of the Book, 10 am, Charlottesville, Virginia. March 20, 2017: Book talk at the Cosmos Club, 12:30, Washington, D.C.
January 13, 2017: 100th anniversary of Leon Trotsky’s arrival in New York City. November 22, 2016: Book talk at New York Public Library, Mid-Manhattan, 455 Fifth Avenue, New York, NY. October 20, 2016: Book talk at The Writers Center in Bethesda, Maryland. September 21, 2016: Book talk at The Book House at Stuyvesant Plaza, Albany, NY. September 20, 2016: Book talk at Book Culture bookstore, 7 p.m., 450 Columbus Avenue, New York, NY. September 14, 2016: Kick off event at Busboys and Poets, Washington, D.C.
September 13, 2016: Release of Trotsky in New York, 1917. May: My Viral History blog passed another milestone, topping 400,000 page views. Thanks to everyone who checked it out. January: Thanks to PBS for the chance to appear on their new American Experience documentary “Murder of a President” on the assassination of President Garfield. September: Appeared in AHC Network (Discovery) American Titans episode Vanderbilt v. Drew, on the epic and amazing 1868 Eire Railway takeover fight. January – December: Engulfed in writing first draft of Trotsky in New York, 1917. Handed it in December 14, just over 103,000 words. Exhausted !!! 2008-2014: Mostly put writing aside again to focus on practicing law. But, as with earlier hiatus, never lost the itch. 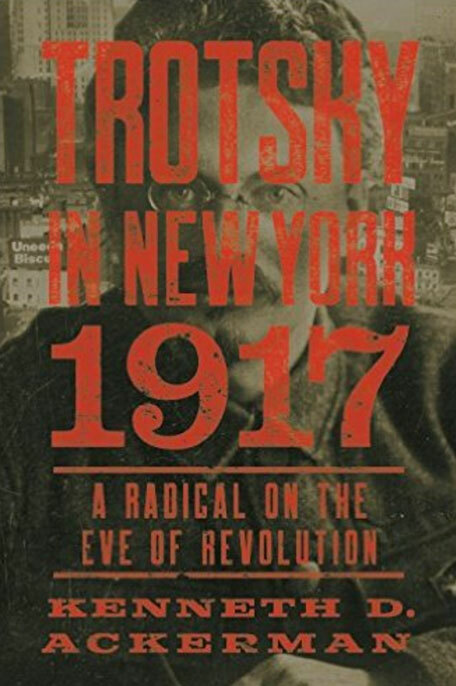 Then, in December 2014, signed with CounterPoint Press in Berkeley, California, to produce my first major new book in nine years, what would become Trotsky in New York, 1917. Was somewhat terrified that now I actually had to write it, being slightly out of practice. May: Interviewed for Oral History project on C-SPAN “Booknotes” organized by George Mason University. March: Moderated panel on Self Publishing at Books Alive! 2014, sponsored by the Washington Independent Review of Books. February: Led my annual my workshop on Narrative Nonfiction: History and Biography at The Writers Center in Bethesda, Maryland..
December: Gave interview with Washington Independent Review of Books on new book Horse Radish: Jewish Roots. February: Gave talk on assassination of President James A. Garfield at the Flagler Museum in Palm Beach, Florida. Click here to watch. 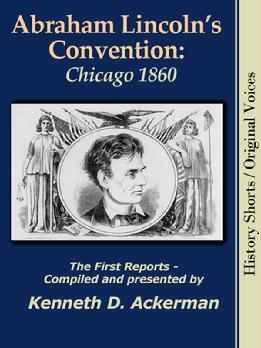 June-July: Developed, wrote, and released Abraham Lincoln’s Convention: Chicago 1860, a Viral History Press LLC original, as a warm-up for that summer’s presidential nominating conventions. June 23: Spoke at Writers Center annual conference “Publish Now!” on trials and tribulations of creating Viral History Press LLC. May: Released new edition of Kinehan Cornwallis 1878 classed “The New York GOLD ROOM: Wall Street’s Big Gamble on the Civil War” via Viral History Press LLC. May: Spoke at Gaithersburg book festival on J. Edgar hoover. See coverage on C-SPAN BookTV. April: Spoke at the Annapolis Book Festival on self-publishing. January 18: Spoke at Library of Congress on J. Edgar Hoover and his time working there as a clerk during the 1910s. Click here for video. November: Participated in flurry of interviews and articles on release of the new movie J. Edgar, including for NPR’s “On Point,” the Washington Post, and the Michael Smirconish radio program. September: Launched Viral History Press LLC , a new publishing venture. Also in March, launch of the Washington Independent Review of Books, of which I was proud to be a member of the governing board. February 15: Gave interview in New York Post on Chester Alan Arthur for Presidents Day. November 19: Spoke at the Park Avenue Armory in New York City on “Boss Tweed: Political Villain or Social Reformer,” along with Columbia professor and well-known NY historian Kenneth T. Jackson. June 13: Awarded the Philip M. Stern Award by American Independent Writers (AIW) for outstanding service to AIW and the Washington, D.C. writers community, at the AIW’s 30th Annual Writers Conference. May 29: Gave featured talk for The BIG READ, on Fahrenheit 451 and Young J. Edgar, in Stockton, California. March 15: Appeared in the History Channel’s new program The Beltway Unbuckled on J. Edgar Hoover. February 15: Participated in C-SPAN 2009 Historians Presidential Leadership Survey. Click here for my submitted list of rankings. April 30: Spoke at the Montgomery County Library in Gaithersburg, Maryland. April 26: Spoke at the Los Angeles Times Festival of Books, panel on Infamous Lives on Hoover. Watch on C-Span. 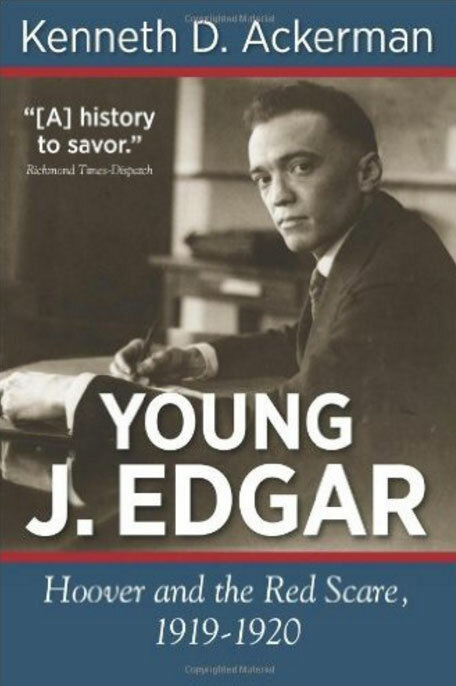 April 15: Release of paperback edition of Young J. Edgar, from Da Capo Press. March 27: Spoke at the Virginia Festival of the Book on J.Edgar Hoover. March 25: Interviewed by WAWS radio, Champaign-Urbana, Illinois. January 13: Spoke at the JCC of Northern Virginia, Jewish Book Festival. Also in 2007, joined the board of a reorganized new version of the WIW Freedom to Write Fund, which would change its name and lunch the Washington Independent Review of Books in 2011. Also around this time, I started becoming a regular at another of my favorite Washington writers’ salons, the Washington Biography Group. October 20: Spoke to Association of Trail Lawyers of America on Hoover. October 19: Interviewed by with Fred Dicker, WROW, Albany, New York on Hoover. July 10: Interviewed by Leonard Lopate Show, WNYC, New York on Hoover. July 9: Interviewed by Joey Reynolds Show, New York on Hoover. June 21: Interviewed by KKNW Empowerment Radio, Seattle, Washington on Hoover. June 15: Interviewed by KVON, Napa, California on Hoover. June 9: Spoke at Washington Writers Annual Conference, Biography Panel, on Hoover. June 9 and 10: Appeared on C-SPAN “After Words” by Joan Biskupic on Hoover. May 26: Spoke at Borders Books, Albany New York, on Hoover. May 25: Interviewed by WAMC Northeast Public Radio on Hoover. May 22: Spoke at a Washington Independent Writers (WIW) Pubspeak on Hoover. May 14: Spoke at the Barnes and Noble in New York on 82nd Street on Hoover. May 10: Young J. Edgar is released with two kick-off events, one in New York at day at the New York Historical Society and a second in Washington, D.C. on Mat 12 at Politics and Prose Book Store. May 9: Gave preview talk on Hoover at the New York City Bar Association. May 8: Interview with The Bob Edwards Show, XM Public Radio, on Hoover. May 2: Twenty-fifth Anniversary of J. Edgar Hoover’s death in office in Washington, D.C. after 48 years as Director of the FBI. Feb. 11: Spoke at Flagler Museum, West Palm Beach, FL, on Boss Tweed. November 14: Awarded best new book for 2005 award by the Victorian Society of New York for Boss Tweed. October 21: Spoke to New York State Judicial Institute meeting in Cooperstown, New York, on Boss Tweed. February 13-16: Gave four talks to chapters of the Prologue Society in Palm Beach, North Palm Beach, Boca Raton, and Stuart, Florida. October: Signed once again with Carroll & Graf/Avalon for a next new book, this time focusing on the early career of long-time FBI director J. Edgar Hoover and his role in the post-World War I “Red Scare,” what would become Young J. Edgar. Spent most of the next year producing a first draft, submitted in late 2006. 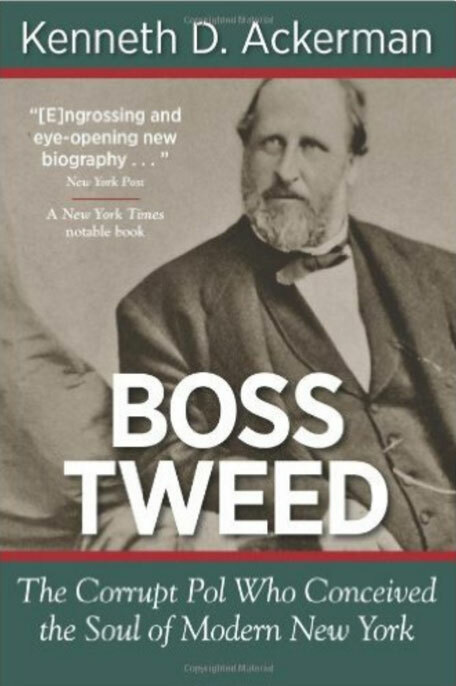 March 1: Launched Boss Tweed with event at the National Arts Club (Samuel Tilden’s original home on Gramwercy Park) in New York City. December 14: Spoke about Contracts and Copyrights: Lessons for Independent Book Writers, for Washington Independent Writers, December 14, 2004. October 5, 2004: Spoke at “The Race at Case,” a symposium on Ohio in Presidential Politics held in conjunction with the 2004 Vice Presidential Debate, on James A. Garfield. Also in 2003: Joined the Board of Washington Independent Writers, one of the great organizations supporting writers with a following throughout the East Coast and, in 2011 after several reorganizations, would evolve into the sponsoring group for the Washington Independent Review of Books (WIRoB) and its annual Books Alive conference. I am proud to still serve on the WIRoB’s advisory board. November: Signed with Carroll & Graf/Avalon again for a next new book, this time a biography of New York’s “Boss Tweed,” another character who had fascinated me for years. Spent most of the next year producing a first draft that in submitted in late 2004. 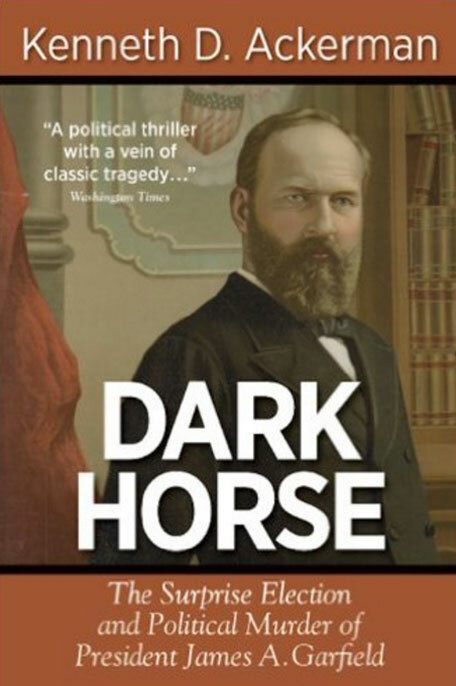 July 2: The 120th anniversary of Garfield shooting by Charles Guiteau, Dark Horse finally released. Roll out included interviews on NPR’s “All things Considered” and C-SPAN’s”Book notes,” and talks at Politics and Prose and the Garfield National Historic Site in Mentor, Ohio. February 25: Signed with Carroll & Graf/Avalon to produce a new book about the 1881 assassination of President James A. Garfield, a story that had long fascinated me. Spent most of the next year grinding out a 150,000 word first draft, titled Dark Horse. 1988-2001: Mostly put writing aside to focus on years as Senate staff counsel and then as Clinton administration appointee to administrator USDA’s USDA’s Risk Management Agency and Federal crop insurance program. Joined OFW Law in February 2001. But never lost the itch along the way. Release of my first published book: The Gold Ring. A paperback edition would be released by Harper and Row, Inc. in February 1990. Early 1980s: Working as a young lawyer for the staff counsel to the CFTC, began writing a flurry of articles and reports on financial regulation, culminating in the report on the agency’s investigation into the 1979-1980 Hunt silver corner. 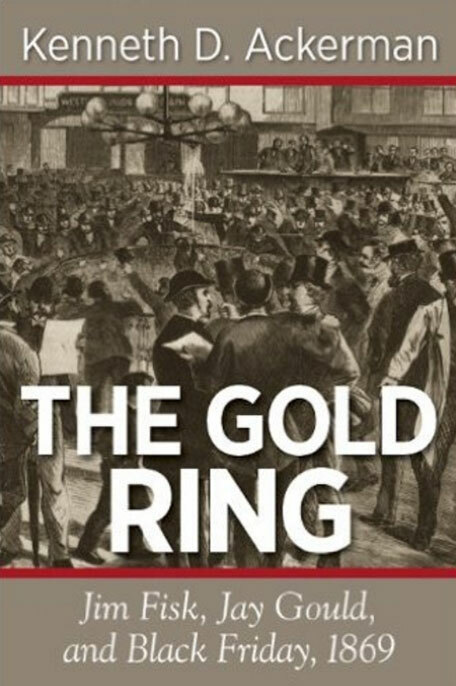 This, in turn, gave me the idea for my first book, The Gold Ring, about the attempt by Gilded Age speculators Jay Gould and Jim Fisk to corner the U.S. national gold supply in 1869. 1970s: Tried writing two different novels. Finished each one. But they were terrible and deservedly rejected by multiple agents. Never tried writing fiction again.